Food Monday ~I am partial to a Swede. This time I am not talking about you Anders, I am in the mood for food. Deep in concentration on my crochet the other week at Parlour Yarns… I realised the conversation had turned, as it often does, to food. Suggestions for dinner were asked for or shared. I cocked my ear to listen more intently. They were talking Turnips of the Swedish variety. It is often known as yellow turnip, Russian turnip, or in America, rutabaga. In Scotland it is known as ‘neeps’. I never knew it was a member of the cabbage family. 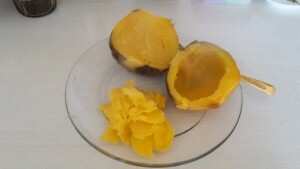 My only problem is cutting off the root, then peeling, and cutting the tough flesh into chunks. It appeared on our table regularly while growing up, always boiled in chunks. Jack liked it boiled with the potatoes and mashed – I now use it this way for the roof of my Shepherd’s pie with a little sprinkling of crushed crisps to finish it off. Ray had the floor and was describing a simple way to produce wonderful golden yellow flesh without any peeling or chopping! When the laughter stopped someone asked how you knew if it was cooked? Well, you know what is coming… I had to give it a try. 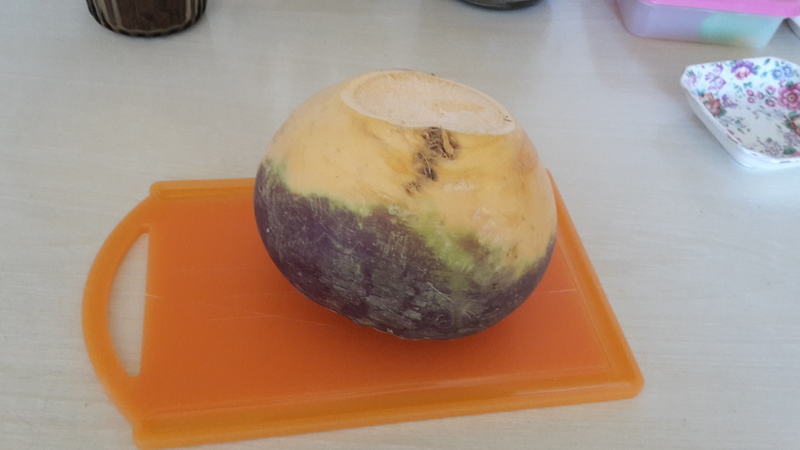 I pulled out the swede/turnip from my Vegetable box. I weighed it 900 grs. Placed it on a plate with a layer of kitchen paper over the top, set it in the Microwave ( mine is an E 1000W) on High power for ten minutes… I did not want any explosions. I tested it with a metal skewer at that stage and decide it did need more time. Two sessions of five minutes later (Ray was right!) I lifted it out onto the counter and let it sit a minute. There was a bread knife on the counter and I lifted it and cut the turnip in two as easily as a loaf of bread. The flesh was soft but not soggy. I spooned it out onto the plate and it mashed easily with a fork. There was more than one helping for me so I bagged the remainder and froze it. I had it yesterday with dinner and it was perfect. I’ll do it this way in future, No struggling to peel or chop the raw turnip and the cooked shell of skin is as soft as a coarse baked potato skin. This entry was posted in Uncategorized on April 11, 2016 by Grannymar. We do this for all root vegetables, and for squash and pumpkin. If it has seeds, you have to slice into it. (Large slits are enough) For baked potatoes or crisp vegetables, I bake them a few minutes afterwards. I love neeps, but didn’t know you can cook them with mash. Will definitely try this. thanks. 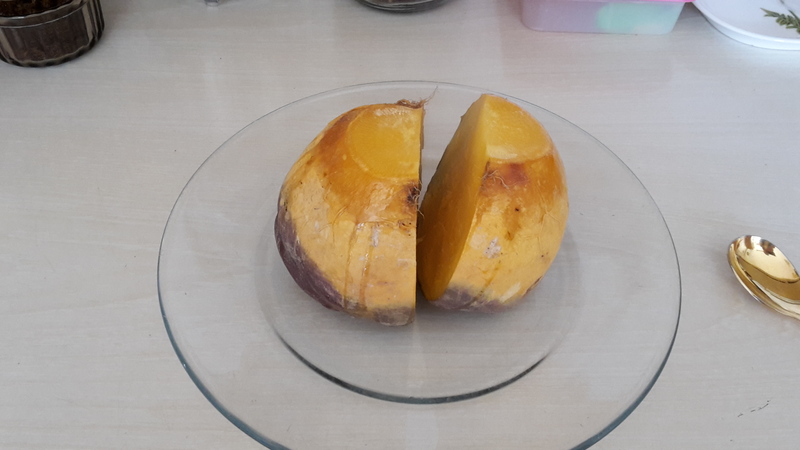 I have never cooked pumpkin but do love squash, So far I have used a potato peeler to remove the skin from a squash before slicing or chopping it. I must try it in the microwave as you suggest. Do you eat or remove the seeds when it is cooked? we remove them, actually, since we don’t like the taste, but many people salt and dry them. Ps if you use hokkaido you eat the skin-no peeling. pumpkin can be nuked, then mashed, and used, with cinamon cloves and allspice in pie or coffeecake. I cook squash all the time, then serve the halves with butter or butter and brown sugar. Like a small boat you eat out wiht a spoon. Oh, and sweet potatoes are great in a micro, and make an entire meal. ps if thee pumpkin is especially thick skinned, cut in half, or make very large slits. I never heard of hokkaido, is it a type of salt? Oops! that comment went unfinished. I regularly cook my ordinary and sweet potatoes in the micro but like to finish them off in the oven. Very interesting. I will try with the Indian variety. Glad to be of service I hope it helps. I guess I will have to grow them to try your trick. I do love them, but in our grocery, they are all wax covered, so have to be peeled to cook them. I do sweet potatoes and small winter squash in the oven or microwave all the time then scoop out the cooked flesh. Yes, I regularly bake the sweet and ordinary potatoes in the microwave and it is so easy to split and scoop the flesh. I really must try the squash that way. I’m going to comment on using a knitting needle to test “food cooked” – I have a couple in my kitchen which I used to use for cakes/baking – very handy and just the right size…especially if you have long steel jobs. Goodness, Cathy, I could not condone using a knitting needle as a defence weapon. I would hate an intruder to turn the tables and use the weapon on me. Do take care. oh, sorry I was using that in an imaginary thought/metaphor…and you do make sense. Great idea. Here we call them turnips and the white kind “white turnips” which are not eaten much here. Was that a total of 20 minutes for the micro turnip? Marvellous method. Small white turnips are sold for eating, but the large whites are used for animal food. Yes. I did it in four increments of five minutes = 20 minutes total. I’ve eaten Chinese turnip paste. It’s made into square cakes and fried on a griddle. Yummy !